Versatile, affordable, and easy to use: our Wool Locks are perfect for so many crafts. Add a dash of color and exciting texture to your next fiber art projects, whether you're a needle felter or doll maker. Wool Locks are not combed or carded, and are priced accordingly. Please note that the pictures are representative only; this is a natural product, so each 1oz baggie looks a little different. Occasionally small pieces of vegetal matter may be included with your bag--these particles are easily removed by hand. The fiber staple length varies between 2"-4"/50-100mm long and there is approx. 1oz/28g in each bag. We recommend hand washing your finished work in cool water. With Living Dreams Yarn and Fiber products you can always be certain to create your own unique work of art. We commission independent dye studios and local fiber mills to produce small batches of our exclusive "Private Label" fibers...your purchase of our products directly supports independent artisans, fiber mills, local farms and their communities. 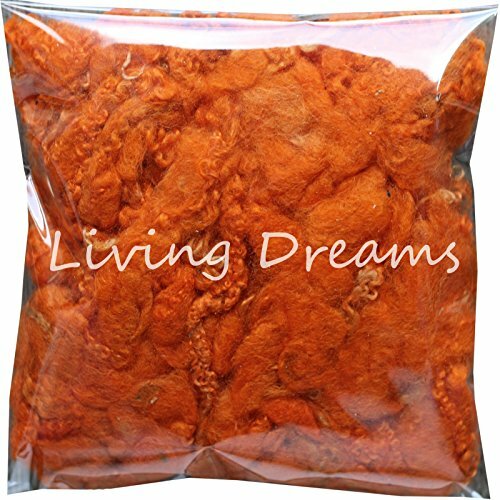 If you have any questions about this product by Living Dreams Yarn, contact us by completing and submitting the form below. If you are looking for a specif part number, please include it with your message.